A restaurant with beachfront is an attraction in itself, but one that also features hanging monkey fixtures, a 15-foot wide chandelier and a homemade pasta station is the epitome of destination dining. Hanging monkey fixtures that pay homage to Le Cirque’s thematic roots Le Cirque means circus, after all. Circo Dallas is more than a restaurant. It’s essentially an adult playground. To learn more about what went into creating the hotspot that debuted on March 30, Modern Restaurant Management reached out to Lauren Santagati, CEO, Circo & White ROC Hospitality Group. Why add beach/pool elements and how challenging is it to incorporate them into a design? 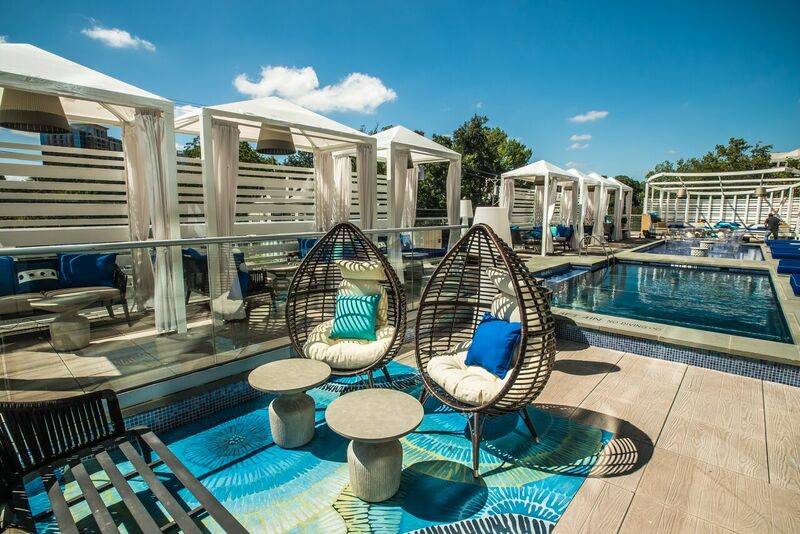 Circo Dallas is designed as a resort-style experience. We wanted to create an “All Day, Eat-Stay-Play” environment that was completely different from anything else in the city. Guests can take a yoga class or dip in the pool, dine on some of our signature dishes, and have a nightcap under the Dallas skyline – either at different times or in an all-day getaway. The restaurant is on the first floor and Circo Beach is on the second, just up a spiral staircase dominated by a striking 6,500-pound chandelier that is a work of art in itself, so there was no design conflict between the two sections. Each stands alone, but each flows naturally into the other with a distinctive elegance and modern sensitivity. Structurally, how do you incorporate a 65,000-pound chandelier into a design? The chandelier weighs 6,500 lbs. and is 15 feet wide. 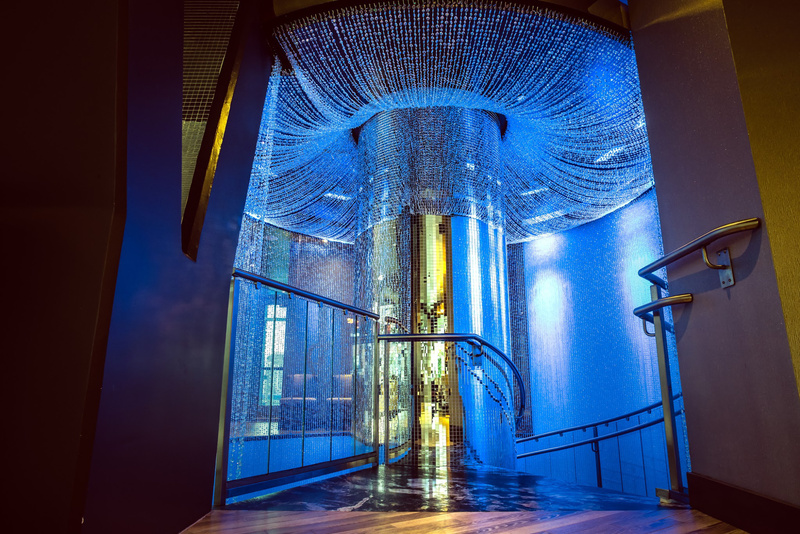 It is integrated into the staircase that connects the first-floor restaurant to the second-floor beach and pool, creating the illusion that you’re walking into a starry night sky as you climb the stairs to the second level. In what ways does the design complement the menu and vice versa? Both the design and the menu are classics with a modern twist. They also pay homage to the Le Cirque legacy. Many of the menu items are Le Cirque signature dishes, for example, and a sheer floor-to-ceiling mural of Le Cirque founder Sirio Maccioni and former First Lady Jackie Kennedy provides a larger-than-life reminder that Le Cirque was New York’s premier restaurant to the stars for more than 40 years. Without Le Cirque, Sirio Maccioni’s legendary Manhattan restaurant, there would be no Circo Dallas. Our menu includes many of Le Cirque’s signature dishes, from Ravioli Mamma Eggi to handpainted truffles, and our décor incorporates elements from the parent restaurant like hanging monkey fixtures that invoke the circus theme of the brand. It’s our way of carrying on the legacy of one of the greatest and most charismatic restaurateurs of our time. What went into finding and curating all the treasures for the design? We worked with Sirio and his youngest son, Mauro, to incorporate artifacts and images from Le Cirque in New York into the Dallas location. We sorted through hundreds of original letters to Sirio, including celebrity fan letters from people like Richard Nixon, Bill Clinton, David Rockefeller, Barbara Walters and the Duchess of York who patronized the New York restaurant. We also found stories about how creme brûlée evolved in the United States, how the White House created a holiday tradition, and how Sirio helped create a path for many chefs. Some of these are displayed in the Dallas location. We also incorporated monkey fixtures because there is a monkey motif in every Circo and Le Cirque around the world, reflecting the brand name which translates to “circus,” and images like the one of Sirio with Jackie Kennedy that I mentioned earlier. It took years to develop and customize every detail on how to make our vision come to life. Do you feel the work is not really over as you could keep adding and subtracting with new old finds? In terms of design, we’re always on the lookout for Le Cirque mementoes or other items that fit our theme. In terms of menu, that changes quarterly. We’re always bringing new things to the table – literally. What do you want the guest experience to be? How does Circo Dallas differ from Le Cirque? Circo is the more casual concept. Le Cirque is true upscale dining, and it always sets the bar. We are proud to be part of both.